As part of its residential cycle parking programme the Council are currently looking to trial 10 secure cycle parking units this financial year, similar to the ones in the attached picture. The Council now has 10 locations for the trial and if it goes well the Council hope to roll them out across the Borough wherever there is demand. The way the Council will choose locations going forward will be through resident requests. 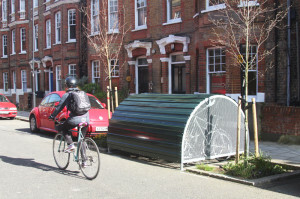 If you are interested in secure cycle parking near your home please email Eric Duval the Borough’s Cycling Officer at the following email address: eric.duval@walthamforest.gov.uk and Eric will add you to the waiting list.